Charlie Forbush’s (far left) Inter-community mob. Once again summer is winding down, and cooler temperatures will return. 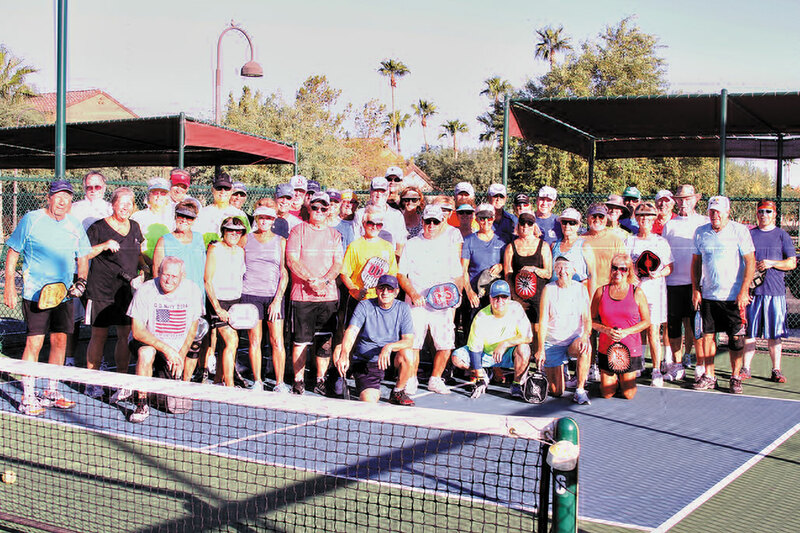 High temperature and humidity does not deter pickleball players around the Eloy – Casa Grande communities causing them to hibernate and wait for cooler temperatures. Starting early in the mornings six days a week, a collection of players (sometimes large and sometimes small) will be found on the courts of Robson Ranch, Palm Creek and Mission Royale. Inter-community play is a great way for pickleball playing residents of these communities to socialize over a competitive game of pickleball. Each community hosts the other two communities’ players on their scheduled days throughout the months of May through September. During these months all play is “open” to players of all skill levels promoting a more social atmosphere but still with the competition element of the round-robin doubles play. Charlie Forbush from Robson Ranch, Avis Gray from Palm Creek and Bill Fleming from Mission Royale are the driving forces keeping these games going, and members of our club appreciate their time and efforts. Once “high” season arrives the daily inter-community play converts to a more competitive level of play with ladies and men’s doubles play scheduled on separate days by skill levels. This play is worked into the schedule around the RR community’s schedule of round robin play. Each year the scheduled round robins are growing in size as our community grows, and interest in the game increases. This year’s summer play also experienced a much larger number of players compared to previous years due to the increase in full-time residents and greater interest in the game. An email was sent by the club secretary, MJ Wong, to members with a schedule of nearby AZ tournaments encouraging our members to grab a partner and participate in one of these tournaments. This is a great idea to have a good time playing the game but most of all to experience all the fun and camaraderie that comes with meeting and playing with the great people that play pickleball. If participation in a tournament is not your desire, take time out to visit one of the tournament sites and watch and learn how entertaining tournament play can be. You might catch the bug and aspire to be on the winners’ podium. Of course, if you only see one tournament (besides our own all-resident tournament and sanctioned USAPA annual skill level tournament), it should be the USAPA National tournament to be held at Sun City Festival in Buckeye, Arizona. The dates for this tournament are Sunday, November 2, 2014, through Sunday, November 9, 2014. The complete schedule of play can be found online at the following: pickleballtournaments.com. You will be amazed by the level of skill displayed at the nationals or any of the other tournaments. With this amazement you will be charged up to get back on our courts and work hard to improve your skills or just as a great source of exercise. It’s all good!